Letterkenny made it 6 from their last 6 on Saturday when they welcomed 5th placed Newry. 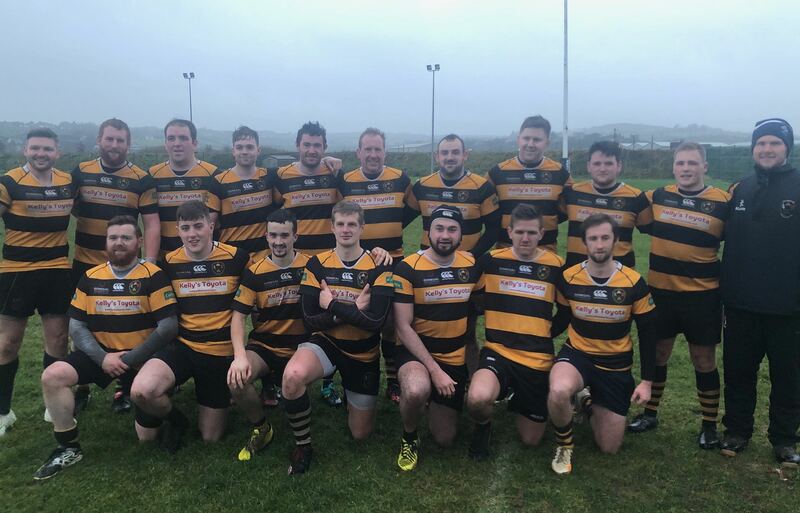 Both sides came in to the game on a good run of form while their previous meeting saw Letterkenny edging a close contest in Newry 33-31. Letterkenny started the more positive of the two when they won a penalty just inside their own half. Brian McGinley kicked deep in to the corner to give Letterkenny an attacking lineout 5m from the Newry try line. From the resulting lineout, Letterkenny powered over through the drive and determination of prop Dave Ward. McGinley added the difficult conversion and Letterkenny led 7-0. Following the restart, flyhalf Darragh McConnell got his backline moving well and Letterkenny found space down the left hand side of the pitch. Christopher Digimas, looking fairly comfortable in open space, made yards down the wing before supplying the inside pass to Chris Peterson. Peterson made further yards before scrum half Fogarty spread the ball wide. Seeing the gap, second row and regular tryscorer Ciaran Clarke slipped in beneath the posts for Letterkenny’s second score of the game. The third score of the game came just on the turn of half time when James Sweeney made his second electrifying break of the game up through the centre of the Newry defence. After good ball presentation and some clean rucking from Kevin Callaghan, James Lee McLoughlin was on hand to crash over. McGinley once more made the conversion look easy bringing the half to a close. HT Letterkenny 21-0 Newry. After the break Letterkenny received the kick off but their exit strategy let them down and Newry were on hand to pounce on the mistake. Their fullback, running off the shoulder of the Newry winger, took the pop ball and skipped beneath the posts for a well needed life line. Shortly after, Letterkenny made a change on the wing when Daire Turley replaced Tony McBride. Letterkenny went in search of the bonus point and came close but for a misjudged pass from McGinley. McGinley who was looking to find his winger, threw a pass which is expected to arrive in Cork on Tuesday. Following that, Letterkenny heaped on the pressure and their fourth try eventually came through their captain Dave Brown when he picked from the base of the dominant Letterkenny scrum and fended off the attention of two would be tacklers. McGinley redeemed himself with another fine conversion and Letterkenny led 28-7. While most teams would begin to fade, this Newry team had other ideas. Such is the ability and character of this particular Newry team, they continued to dig deep and dominated the next 15 minutes of the game. Their fullback sliced through the Letterkenny defence once more to make the score 21-14 before their tight head prop who always proves a handful for Letterkenny, brought the game back to one score. Approaching the final 10 minutes Newry were just 7 points adrift and in the ascendency. Letterkenny however, steadied the ship and following some tidy and efficient play, were able to see out the remainder of the game and record another victory over the Belfast club. Letterkenny now sit joint 4th with Holywood who they face next week in a cup quarter final and league double header. Holywood were the victors early in the season at the Glebe when the two sides met, but Letterkenny have improved a considerable amount as the season has developed and this crunch game will be a measure of just how far they have come. A win would afford Letterkenny some breathing room in 4th place and project them in to an Ulster Semi Final while a loss would be a double blow for the squad. Next week will tell a tale.